https://www.SERoundtable.com/ – This week in the search video recap I cover Overstock.com’s woes with Google’s rankings how much of an impact it had on their earnings. Matt Cutts said Google release their “secrete sauce” when they open sourced TensorFlow, their machine learning system. Google Search Console analytics data is catching up after having a huge delay. Google now has TLS and SSL certificate warnings in the Google Search Console when you mess up. Google Search Console now shows severity of blocked resources in the fetch and render report. Bing released their mobile friendly testing tool. Google cleaned up their search URLs. 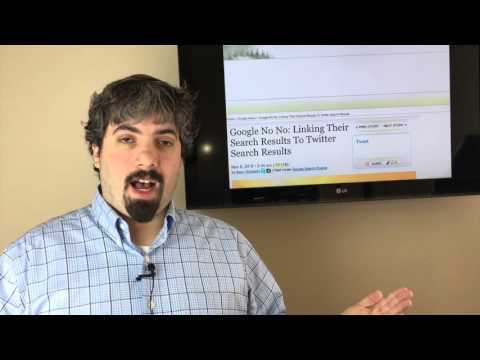 Google is linking in their search results to Twitter search results – that is a bad bad thing. Google said not to follow big sites SEO because they often get it wrong. Google AdWords released two new simulator tools, is testing new SMS based ads, has a new structured snippet feature for Cyber Monday and Black Friday and updated their AdWords preview tool. Bing Ads is releasing a desktop client for Macs. Yahoo launched new Product Ads. Many hate the new tablet Google search interface. Google News added app icons to Editors Picks with apps. Google Safe Browsing tool shows Google.com as being unsafe. That was this past week in search at the Search Engine Roundtable.